Hello! It's time for a brand new Mojo Monday sketch (#271). Today's fabulous sketch is brought to us by Teresa. I had a lot of fun playing with this sketch and all the layers! I stamped, colored and pieced the sweet reindeer from Santa's Helper, then I cut him out and popped him on top of my layout. My sentiment is from Holiday Greetings. I used patterned paper from the Teresa Collins Christmas Cottage collection. Accessories: Standard Circle and Scalloped Circle Nestabilities (Spellbinder), Medium Scallop Border (Taylored Expressions), Markers (Copic), Twine (May Arts), Rusty jingle bells, Foam tape, Thread, Sewing machine. Adorable card. Love the colors and the sweet "Santa's Helper" image. Stephanie, this is just too adorable! Love these gorgeous papers and your sweet little Rudolph! So, so cute, Stephanie!! Love how you paper pieced his tummy :) Great mix of papers and the bells are the perfect touch! Wonderful mojo card! wow, this is gorgeous,....so bold and pretty, great coloring...have a fabulous week! Adorable card Stephanie! 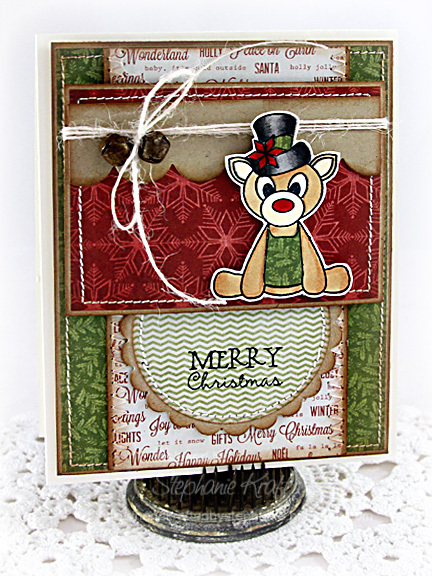 Love the sweet Rudolph and your mix of patterned papers! Your card is just so adorable. This Rudolph is just too cute. Great paper choices and love the bells.